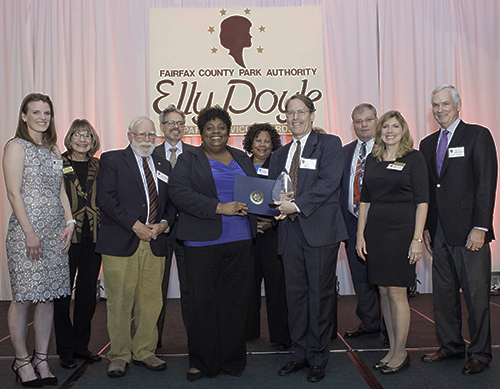 The Fairfax County Park Foundation established the Eakin Philanthropy Award to recognize visionary financial and material contributions that significantly enhance Fairfax County parks. 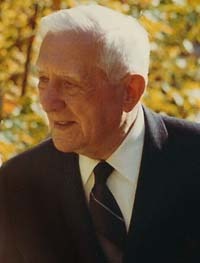 In 1951, LeRoy Eakin, Sr. donated 14 acres of land which was Fairfax County's first park. 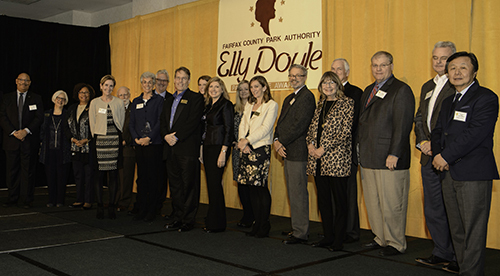 The Eakin family gave another 240 additional acres which ultimately became the Fairfax County Park Authority. 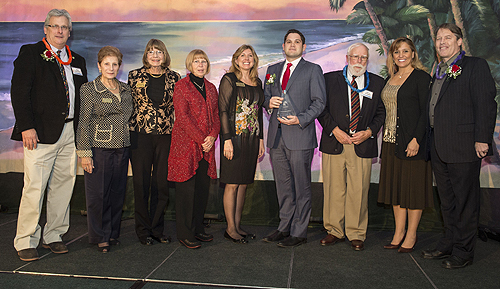 The Park Foundation is proud to recognize individuals and organizations who help to continue the Eakin legacy. The Washington Nationals and it’s Dream Foundation Legacy Fields program provided $1 million in turnkey renovations for a diamond field Mason District Park named for Hall of Fame catcher, Ivan “Pudge” Rodriguez and the Bryce Harper All-Star Field Complex at Fred Crabtree Park. McLean Community Foundation donated generously since 2004 for initial construction, the Liberty Swing and recent Picnic Celebration Area at the popular Clemyjontri Park along with grants for playground improvements at Bryn Mawr and Kent Gardens Parks. 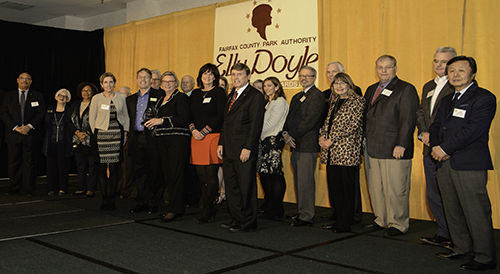 Nancy Wilson was recognized for supporting FCPA trails, through the William ‘Bill’ Vesey Memorial Fund, in honor of her late husband. She inspires others to follow in her footsteps by giving to Park Trail Building and Care which helps this most-used park system amenity. 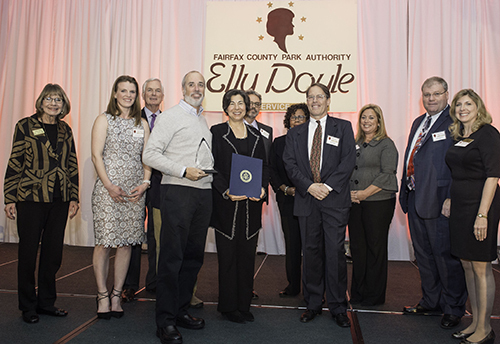 See the Program for the 2018 Elly Doyle Park Service Awards, which includes the 2018 Eakin Awards, and also some photos from the evening's events. 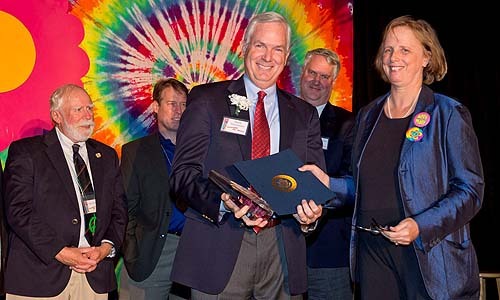 Jean and Ric Edelman invested in a high capacity telescope at Observatory Park at Turner Farm to inspire STEM (Science, Technology, Engineering and Math) education through exciting exploration of the night sky. 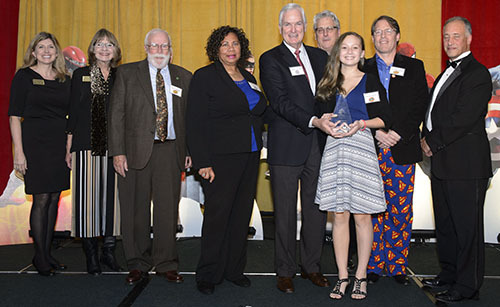 Volkswagen of America contributed to PACT camp scholarships for children in homeless shelters and supportive housing, enriching our community for more than a decade. Chantilly Youth Association (CYA) (pictured above) and Timber Ridge at Discovery Square (pictured below) partnered to create the state-of-the-art Sully Highlands Park featuring multiple lighted fields, batting cages, restroom/concession building, cricket pitch and a playground. Rachel Harris’ organization, Let’s Help Kids supports Rec-PAC summer camps and PACT camp scholarships for children in homeless shelters and supportive housing. 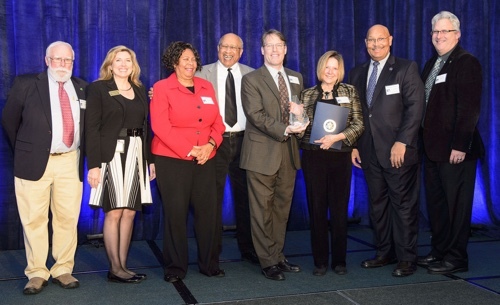 Northrop Grumman has provided generous sponsorship of the Land Preservation Fund, the Meaningful Watershed Educational Experience program, as well as support to Burke Lake Park, Frying Pan Farm Park and Clemyjontri Park. The Ruth & Hal Launders Charitable Trust partnered with the FCPA to create Arrowbrook Centre Park featuring a lighted synthetic field, picnic pavilion, a basketball court, two lighted tennis courts, a bocce court, a playground and trails. The trust underwrites the Arrowbrook Centre Summer Concert Series. 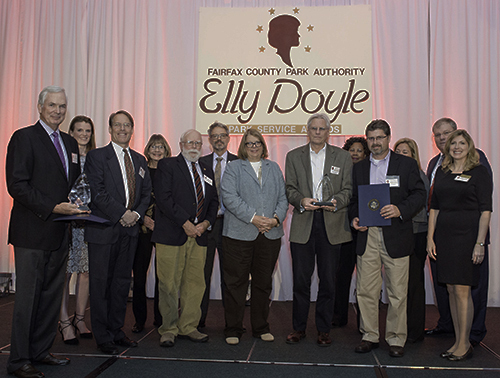 Watch the Eakin Awards and other presentations at the Elly Doyle Park Service Awards 2015! 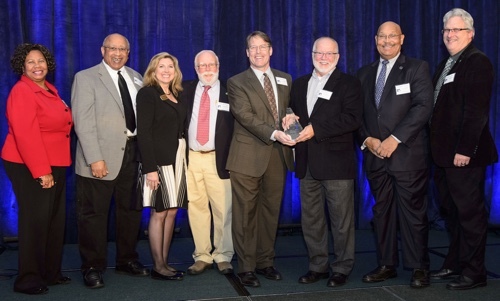 Tom D. Fleury, Vice President and founding member of Cityline Partners, was cited for his career-long dedication to environmental preservation and his commitment to include ample green space in the development of Tysons. Suzan Syron-Singh, Children’s Physical Therapy Center (CPTC) owner/therapist, committed to support of Chessie’s BIG Backyard playground at Lee District Park in memory of her daughter, Kelley Syron, who worked at the CPTC. 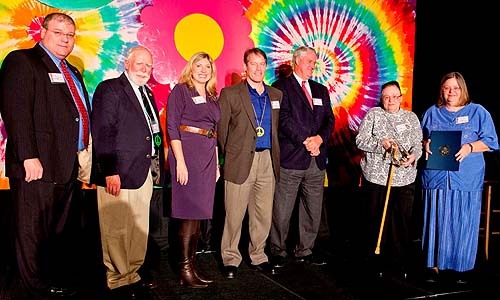 Ann Smith worked with the Fairfax County Park Authority and Mt. Vernon District Supervisor Gerry Hyland’s office to identify a soccer field improvement to be made in memory of her husband. Lt. Col. Gary F. Smith, a civilian employee of the Army, who was killed when American Airlines Flight 77 struck the Pentagon on 9/11. (Presented at the Veterans Day field opening ceremony). 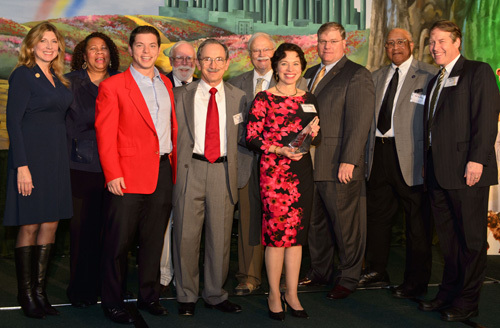 Transurban-Fluor has been a tremendous supporter of park programs and capital projects since 2009. 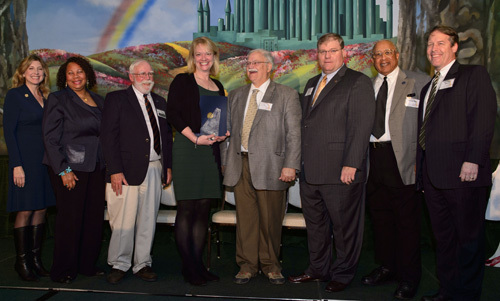 Contributions were made for a diverse set of projects including the Summer Entertainment Series, Wakefield Run Stream Restoration, Adapted Aquatics, Chessie’s BIG Backyard, and the Gerry Connolly Cross County Trail. 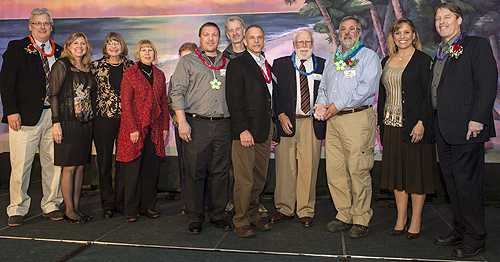 Mike Rolband, president of Wetland Studies and Solutions (WSSI), was recognized for generous and skillful work on the Wetland Restoration Project at Huntley Meadows Park. WSSI contributed nearly 400 hours of pro-bono time, free materials and staff training, conservatively valued at $186,000. ExxonMobil generously supported the Summer Entertainment Series, an outdoor classroom at Huntley Meadows Park, and the Meaningful Watershed Education Experience for seventh graders at Hidden Oaks Nature Center. The RZ Foundation has supported RecPAC camp scholarships, the Arts in the Parks performance series, have sponsored a bench at Hogge Park in honor of family members, and provided funding toward open space land acquisition in this community. 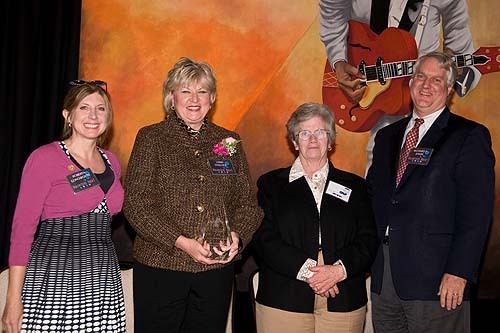 Daughter Joyce Cockrille and granddaughter Jan Wray (right) accept the 2012 Eakin Philanthropy Award honoring Fred Crabtree posthumously for expanding parkland and board service. Presenters include John Osborn, Harry Glasgow, Bobbi Longworth, Tim Eakin Walsh and Richard Eakin. 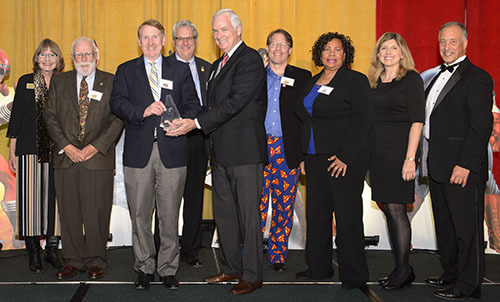 Recognizing the support of Arts in the Parks and board service, Steve Thormahlen receives the Eakin Philanthropy Award on behalf of PNC Foundation from Marie Reinsdorf of the Park Authority Board as Harry Glasgow, Tim Eakin Walsh and Richard Eakin look on. Michael Gailliot (center) of Hilltop Sand & Gravel is presented with the Eakin Philanthropy Award for contributions to Lee District Park including Chessie's BIG Backyard. 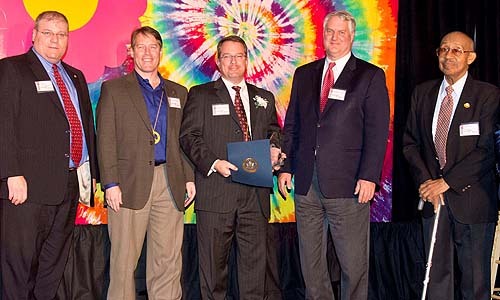 Also pictured are John Osborn, Tim Eakin Walsh, Richard Eakin and Harold Henderson. 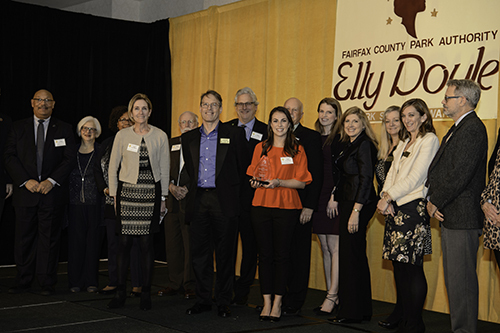 The Fairfax County Park Foundation established the Eakin Philanthropy Award to recognize visionary financial and material contributions that significantly enhance Fairfax County parks. 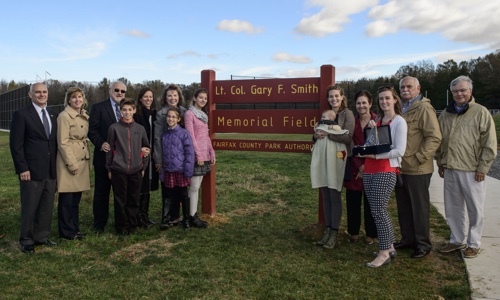 In 1951, LeRoy Eakin, Sr. donated 14 acres of land which became Fairfax County's first park. 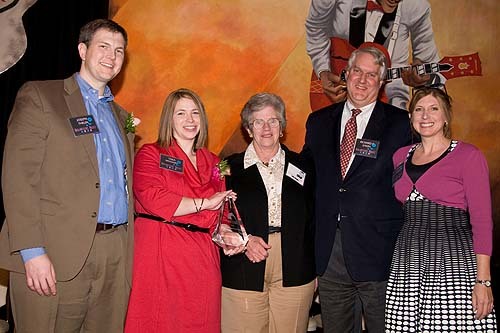 Craig and Belinda Stevens (left) receive the 2011 Eakin Philanthropy Award for individuals from Tim Eakin and Ayda Walsh with their children Kaylee and Ace. 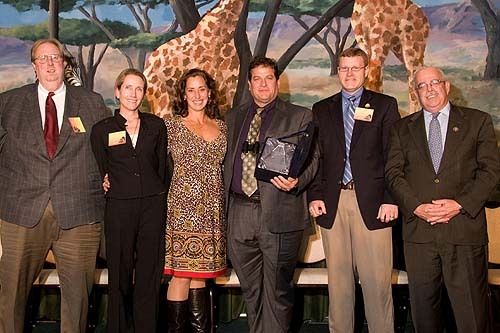 Mike Leone (right) of Cox Communications accepts the 2011 Eakin Philanthropy Award for an organization with Park Foundation Executive Director Bobbi Longworth, Park Authority Board Director Ed Batten, Foundation Board Director Chip Comstock and Foundation Board Treasurer Steve Thormahlen. Joseph Thelin and Tara Mooney are presented with the Eakin Philanthropy Award for individuals for fundraising Katie’s Playground in loving memory of their infant daughter at Royal Lake Park. 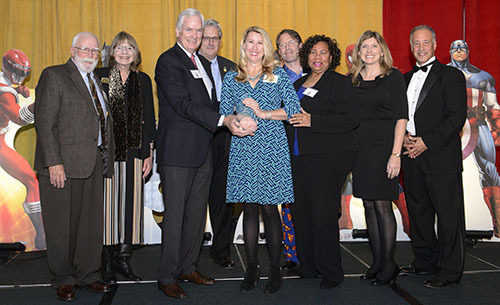 Lynn Tadlock accepts the Eakin Philanthropy Award on behalf of the Claude Moore Charitable Foundation for generous support of Clemyjontri Park and summer camp scholarships for children in financial need and those living in transitional housing shelters. The inaugural Eakin Philanthropy Award is presented to Bob and Paola Pizzano, founders of the Joey Pizzano Memorial Fund recognizing JPMF Splash! and the Our Special Harbor sprayground at Lee District Park.